Google’s foray into social media, Google+, has been busily adding users and receiving great reviews for its innovative design and capabilities. Everybody is raving about circles, the cool picture albums, and the way Google integrated its other properties. After having attracted over 750 million users, Facebook is now finally feeling the heat. Or is it? Google+ has quickly attracted millions of users, enjoying what’s perhaps the fastest growth in history. However, when I look at the type of communication on Google+, I mostly see my professional ‘friends’ posting links to their own blog posts and articles. I do the same - we have all quickly jumped aboard since we understand the power of social media and we use Google+ as a free advertising tool. 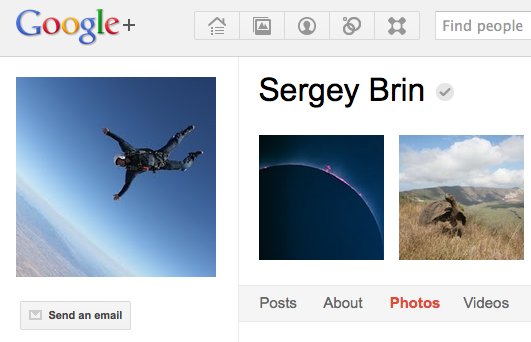 In fact, out of all the people in my Google+ circles, the only one posting something personal is Sergey Brin. There is one fundamental challenge that Google+ has and it is not the features or design. It is a great tool but it doesn’t connect me with any new users. So far, I have been only connecting with the same folks I am already connected with on Facebook or on Twitter. And since we all are already connected on those networks, we continue using them since they work just fine. When I started using Twitter after I was already on Facebook, I was able to ‘connect’ with many new people. The connections are of different type. I am connected with people like Richard Branson and Pete Cashmore on Twitter even if they don’t know me and care about me. Twitter makes it easy to connect with such people since it allows unilateral connections via “following”. On the other hand, my friends on Facebook know me and I know them - it is a bilateral connection where both sides agreed to connect. There is a difference between those two tools which is why I am using them both. 1. I would start using Google+ actively if all my contacts would use it as their primary social network, at the cost of Facebook and Twitter. That’s a hard one to achieve since both Facebook and Twitter are thriving and continuing to add users and - more importantly - traffic. This is the challenge with social networks - according to the Metcalfe’s Law the networks become more valuable as more users join in. But that means that a network replacing another one becomes only useful if it reaches a critical mass of users. And “users” means not people who have signed up but people who actively engage. 2. I would start using Google+ actively if it allowed me to connect with new users with whom I am not already connected with on Facebook or Twitter. There are plenty of people I know who are not on Facebook or Twitter and there are plenty of interesting people out there I don’t know at all. Google needs to find a way to connect me with those folks. That’s what Facebook and Twitter accomplished due to the different type of connections they allow. Find a way how to engage the social media skeptics through some new, must-have services. Or find a way to suggest connections with people who could be interesting to know through a new type of connection. But don’t copy Facebook and Twitter. Of course there is a third scenario possible, if either Facebook or Twitter stumble. They could become sleezy and offensive like MySpace did or nerdy and lame like what happened to Second Life. They could implode due to lawsuits, privacy invasions, availability issues or talent drain. They could go public and start making irrational moves under the pressure from Wall Street. All of that is possible. But on its own, Google+ needs to make happen one of the two scenarios above. And that’s not happening right now. These are both great blogs (Lubor + Stefan's contribution)... maybe Google+ could make suggestions for connections on the basis of interest similarities? If we are posting our blogs for example, maybe we could tag the interests that it might appeal to, and then interests between users is what connects them? I like that, Becca. Google could use all its powerful algorithms to make useful suggestions of people to connect with on Google+. With the technology and data they have, the Google suggestions should be much more relevant than what Facebook and Twitter can do today.